Don’t worry this isn’t a post about lying or “stretching the truth”. My thoughts are more in line with the intentionality we should use with our words. The core idea is that we should, generally speaking, talk less and listen more. While that would be nice it is often hard to do. Especially if you are leading people or if you are parenting. There is a time for listening but there is also a responsibility to share your knowledge and wisdom with the people that are looking to you to direct them. Once you have listened, choose your words carefully so that they can intentionally help increase communication. If what you say prompts people to ask questions about what you are saying that is a good thing. If the questions are centered around gaining clarification about the task you are asking them to do that’s even better. The hope here is that there are some ways you can bring some intentionality to the way you word things that helps to increase communication and invite conversation. With teenagers this is a key to getting the information you need from them to help them or to realize that they don’t need your help. There are plenty of communication lessons you can learn out there but today I want to focus on how the way we word things can make a lot of the difference. When you say something you should mean it. I hear adults often threaten the youth they work with but everyone, including the youth, know they would never follow through on what is being threatened. This is a tough thing at times but it is definitely not impossible. The truth is it is much better to take a step back and use less harsh language that you are able to follow through on than threatening something huge that there is no way you will follow through on or worse that if you did you would regret it. Think about how certain phrases can either teach or hinder learning. The students you work with need to learn from you. And to complicate things they will likely have different learning styles than you. So thinking clearly about how to phrase things is very helpful. Working out in your mind how to put things simply and then wait for their clarifying questions is a job that is tough but worth the effort. 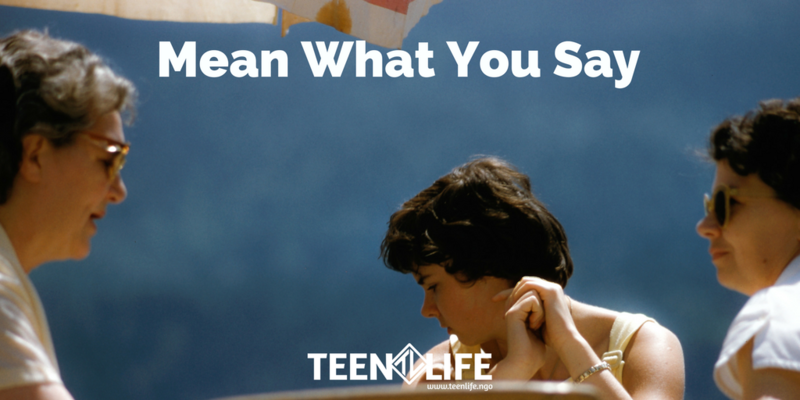 If, as adults, we think through the possible ways a conversation can play out (based on how well we know the teenager) we will help move things forward much more effectively by using the least amount of explanation possible. The truth is with teenagers it is not necessary to explain all the details. They are learning from a lot of different places so it may be true that they have gained information we didn’t give them and can apply it to the situation that is unfolding before you. Allowing this to happen can save a lot of frustration and time for both you and the teen. Sometimes leaving out words or whole sentences benefits the conversation. We often think that we can just give all the information to a person and they will grasp it and will be able to tackle the task at hand and accomplish what we want them to. The truth is sometimes leaving out little details can actually help the person by allowing them to figure out certain pieces of the task themselves. It may also requested them to ask for help and the process of them knowing what they need actually helps them understand problem solving better than if you just gave them the answer from the beginning. This must be used very deliberately and not as a test (although there is a place for that) but instead as a way to challenge someone who is needing to learn and possibly even experience some failure. These 3 approaches to working inside of relationships will help you to reduce stress that often comes from the give and take of conversations. Implementing them takes knowing the people you are interacting with. They will not work the same with everyone but instead will need to be carefully evaluated and used with discretion in order to gain the most beneficial outcome. What are some ways you have found that you can mean what you say in order to gain the most benefit out of your interactions with students? Ricky Lewis is our Executive Director and has been with us since the beginning. As a father of 7, he seeks to help parents and their kids Live Life Better.